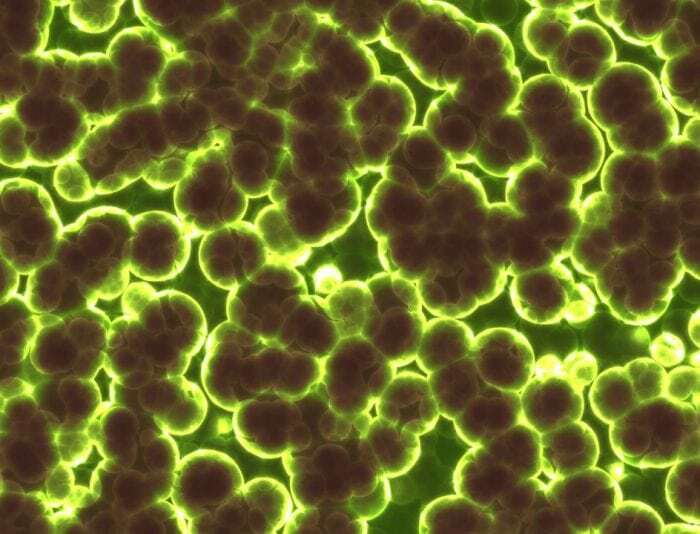 Microbes: The Right Target To Feed The World And Protect Nature? In agriculture, nitrogen (N) is one of the most important nutrients to improve plant growth and is applied in the form of fertilizer. Plants can take up nitrogen in the form of ammonium (NH4+) and nitrate (NO3–). However, a derivative of ammonium, ammonia (NH3), is also being used by specialized soil microbes. This causes plants to be in a continuous food war with these microbes, decreasing their growth and yield. Once fed, these microbes release nitrate back into the soil. Compared to ammonium, nitrate easily leaches from the soil to the groundwater. This creates potential health risks for humans by lowering the quality of our drinking water and recreational water. Additionally, it can be converted into nitrous oxide (N2O), a greenhouse gas with a global warming potential 300 times greater than CO2. These losses might reduce nitrogen availability for plants up to 50% and is thus highly inefficient. The excessive amounts of fertilizer applied to compensate these losses further lead to biodiversity loss. Compounds that prevent these microbes to use the available nitrogen, so-called nitrification inhibitors, were developed in the 20th century and are usually bound to chemical fertilizers when applied in the field. However, the knowledge about the microbial players affecting this process is rapidly evolving, including the discovery of new and diverse microbes. To enable the exploration of alternative and more optimal nitrogen management strategies, an elaborate overview of the knowledge on the different biochemical pathways used by these microbes to process the nitrogen, as well as their relative importance in agriculture and the possible mode of actions of the nitrification inhibitors, was published in Current Opinion in Biotechnology (Beeckman et al. 2018). Three main groups of microbes compete with plants for the available nitrogen: ammonia-oxidizing bacteria (AOB), ammonia-oxidizing archaea (AOA), and comammox bacteria. They all perform ammonia oxidation, that is, the conversion of ammonia into nitrite (NO2–). In a second step, nitrite is converted into nitrate. How ammonia is converted into nitrite differs between the three groups. For AOB, it was thought that ammonia was first converted into hydroxylamine (NH2OH) by the AMO enzyme and then into nitrite via the HAO enzyme. This two-step process was recently contested as nitric oxide (NO) might be an obligate intermediate as well, implying the existence of a third unidentified enzyme converting NO into NO2–. The AMO enzyme is composed of three building blocks or subunits (amoA, amoB, and amoC), whereby the amoB subunit is believed to bind ammonia and thus to be the main target for nitrification inhibitors. This subunit is not conserved in AOA, so a different mode of action of the inhibitors is proposed. Here, a fourth subunit (amoX), or amoC, might be responsible for the ammonia-oxidizing activity, but more biochemical analyses are required to make better statements. Comammox bacteria obtain the genes encoding the AMO and HAO enzymes via a horizontal gene transfer from AOB. Horizontal gene transfer (HGT) is the transfer of genes between unicellular organisms without reproduction. It is, for example, the same mechanism that causes the spread of antibiotic resistance. Through this HGT from AOB to comammox bacteria, comammox bacteria might have a similar sensitivity towards nitrification inhibitors. Still, differences are expected based on observations on their genetic code and how they process ammonia. All differences between AOB, AOA, and comammox bacteria indicate these microbes are adapted to different environmental conditions. The way they are adapted to their environment influences their presence and activity. AOA, for instance, are usually more abundant than AOB in agricultural soils and their affinity for ammonia is also higher. This means they have an advantage over AOB, especially at lower nitrogen concentrations. As AOB are less rapidly saturated with ammonia, their abundance usually increases more at high nitrogen concentrations. Even though this might indicate a more important role for AOB in nitrogen-rich soils, it should be noted that AOA are still maximally consuming ammonia and, thus, competing with plant roots. When looking at the soil profile, the relative importance of AOB and comammox bacteria most probably follow an inverse relationship, with AOB more abundant at the top layers and comammox bacteria deeper in the soil. AOA, on the other hand, usually will be more important in the intermediate soil layers. The importance of AOA and comammox bacteria might further increase with increasing temperatures and towards the end of the growing season, as soil nitrogen concentrations drop. These discoveries indicate that variation in susceptibility towards different types of inhibitors blocking the use of nitrogen by these specialized microbes might arise from differences in how they process nitrogen, as well as from how and where they sense it. This and the possible important role of the newly-discovered microbes suggest a suboptimal efficiency for the currently available inhibitors. Therefore, the authors claim that the effect of more general inhibitors (or mixtures of inhibitors) targeting all microbial groups might last longer and lower the chance to develop resistance. To get there, investments should be made in research to map the relative importance of all players in more detail, as well as in research that tries to elucidate how nitrogen is processed biochemically and enzymatically by these microbes. As such, controlling microbial activity in soil might be the most exciting target of the 21st century to enhance crop productivity and lower the impact of agriculture on our environment. Microbes — the perfect target to feed the world and protect nature. These findings are described in the article entitled Nitrification in agricultural soils: impact, actors and mitigation, recently published in the journal Current Opinion in Biotechnology. This work was conducted by Fabian Beeckman, Hans Motte, and Tom Beeckman from Ghent University and the VIB Center for Plant Systems Biology. Education: Master in Functional and Evolutionary Biology (UGent) • Teachers degree (UGent) ••• Previous research: Optimization of growth media for terrestric, methane-oxidizing bacteria • Isolation and identification of marine, methane-oxidizing bacteria. ••• Current research: Interaction between nitrifying bacteria and root development. ••• Clifton Strengths: Analytical, Discipline, Deliberative, Focus, Individualization. Hans is a post-doctoral scientist at Ghent University VIB Department of Plant Systems Biology. Tom Beeckman leads the Root Development Group. The root system of Arabidopsis thaliana is an excellent model to study the relationship between cell cycle regulation and growth and development. Understanding this offers a great potential for altering root architecture and water uptake, allowing to design plants to survive under dryer conditions. The research of this group focuses on the formation of lateral root primordia in the pericycle to investigate how cell cycle regulation is involved in the initiation of new organs. Plant roots serve a multitude of functions. They anchor plants and supply them with water and nutrients and exchange various growth substances with the shoots. At the root-soil interface, numerous interactions between plants and their environment take place. The diversity of functions and broad range of interactions with the environment render the biology of roots complicated. During the last ten years, Arabidopsis thaliana has been proven to be an efficient model plant to study root development and time has come to extrapolate the obtained insights to crop species such as maize, a species that is currently also under investigation.